This is a fun topic to have a show about. Barney teaches the smiling kids using things we see everyday in Barney: All About Opposites ! My kids learned all about stop and go, hot and cold, big and small, to name a few. Barney fans will enjoy the same fun loving dinosaur while learning an important lesson. It's fun to see your kids finally grasp a concept. My 2 and 4 year old had a lot of fun with this one! 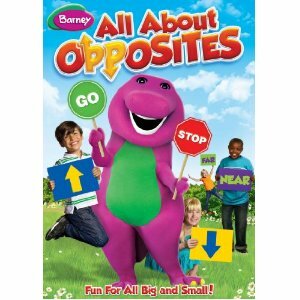 There’s nonstop fun as Barney and his friends go and learn all about opposites! Everyone helps Baby Bop understand concepts like up & down, in & out and high & low. Hey Diddle Diddle, the kids see that they can be big or little, but it’s what’s inside that counts! Then join in as Barney and his friends have a cool time on a hot day in a pretend winter-summer wonderland learning about hot and cold! There's always Tee-rrific teaching and fun when big dinos and small friends are around! The bonus features include a "Let's Learn About Opposites Game" that reinforces what your kids have learned from the shows. Runtime is 75 minutes long and it targeted to 1 - 5 year old kids. You can keep up to date with Barney on Facebook. a Rafflecopter giveaway Giveaway will end August 9th at 11:59 pm. I was given the above dvd to review. No other compensation was received. All opinions are my own. This promotion is in no way sponsored, endorsed or administered by, or associated with, Facebook. We hereby release Facebook of any liability. Winner(s) will be contacted by email 48 hours after the giveaway ends. If you have any additional questions - feel free to send us an email! I was just going through my Facebook wall and my 2 year old saw the Barney picture. She was so excited I just had to come and enter. I hope I win. She will love it. Any comment! Jk. Thanks for the giveaway. Thanks for the giveaway. We love Barney! who does not love Barney. Thank for the giveaway! My kids would love this! Thanks for the giveaway! thanks for te chance to win. Thank you for all these lovely giveaways! Hope you are having a good week. Thanks for the giveaway. my little one loooooooves Barney. Thanks for the giveaway! Thank you - my kids love Barney. I have a Barney watcher in the house. Thanks for the emails and updates. My niece would love this for her upcoming birthday! Thanks for the giveaway my 4yr old loves Barney. thanks for the chance, my daughter loves Barney! I'm on a secret mission to get my granddaughter into Barney!